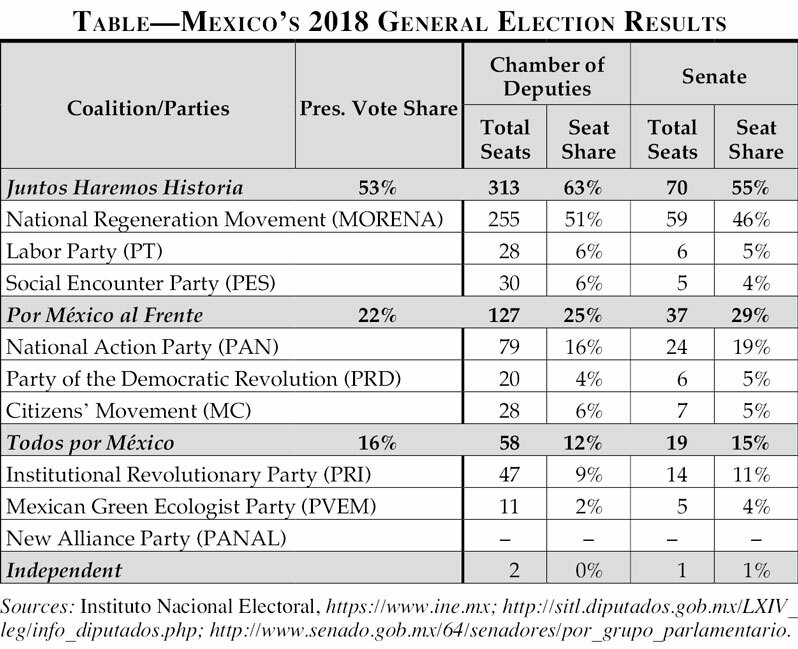 On 1 July 2018, leftist Andrés Manuel López Obrador (AMLO) won a decisive victory in Mexico’s presidential election, while a coalition led by AMLO’s National Regeneration Movement (MORENA) claimed majorities in both houses of Congress. AMLO’s calls for change resonated with voters frustrated by chronic poverty and inequality, rising violence, and corruption, and his win has called into question the stability of Mexico’s party system. Yet AMLO, who strove to assemble a “big tent” coalition, is ultimately more a product of the system than a disruptive outsider. Moreover, clear programmatic differences among Mexico’s major parties persist, as do the institutional advantages they enjoy. It is thus most probable that MORENA’s ascent augurs a recomposition of the party system rather than a process of partisan dealignment. On 1 July 2018, leftist candidate Andrés Manuel López Obrador (AMLO) won Mexico’s presidency with 53 percent of the popular vote—a landslide total in a four-candidate race and about 20 percentage points higher than he had polled in two prior runs for the nonrenewable six-year term. In 2018, voters gave him a larger mandate than any Mexican president had received since 1982. He carried all but one of the country’s 32 states and assembled a socially diverse majority that included the left’s small traditional base plus a far larger group of independents. His congressional coalition, an alliance of his own National Regeneration Movement (MORENA) and two smaller parties, won outright majorities in both houses. After winning candidates from other parties decided to join MORENA’s caucus, his coalition controls 313 seats in the 500-member Chamber of Deputies and 70 seats in the 128-member Senate. Following AMLO’s inauguration on December 1, the world’s largest Spanish-speaking country and fifth-largest democracy will be led by a leftist nationalist for the first time since Mexico’s democratization in 2000. Mexico began 2018 with one of Latin America’s most stable party systems, but the continuation of that stability is now in doubt. Drawing on public dissatisfaction over chronic poverty and inequality, slow economic growth, rapidly escalating violent crime, and a parade of corruption scandals, AMLO’s antisystem rhetoric led voters to question the nature of political power in Mexico’s new democracy. His ascent badly damaged the Institutional Revolutionary Party (PRI), the onetime dominant party that survived democratization, reinvented itself, and returned to the presidency in 2012. Six years later, the candidate of the [End Page 31] coalition led by the PRI, José Antonio Meade, mustered a distant third with just 16.4 percent of the popular vote. The two parties that spear-headed democratization and gave structure to Mexico’s party system also now find themselves in trouble. The leftist Party of the Democratic Revolution (PRD) is unlikely to survive MORENA’s rise, and the rightist National Action Party (PAN) faces deep internal rifts after a bruising nomination battle. Both parties weakened their brand names by forming a once-unthinkable left-plus-right alliance in support of Ricardo Anaya, who was runner-up to AMLO with 22.3 percent of the vote. The coalition will hold little legislative power with just 37 Senate seats and 127 lower-house seats. The fourth candidate in the presidential race was Governor Jaime “El Bronco” Rodríguez from the economically important northern state of Nuevo León. Running as Mexico’s first independent presidential candidate, he garnered just 5.2 percent. Why did AMLO and MORENA win, and what does the left’s ascent mean for pressing public-policy concerns as well as the longer-term consolidation of Mexico’s democracy? It could be that 2018 marks a turning point in a long-term process of partisan dealignment. Parties with roots in the dominant-party era may see their support wither as chronically displeased voters (like those in other countries that experienced party-system breakdown) turn to personalistic outsiders, engage in serial protest voting against incumbents, or turn away from electoral politics to voice their discontent outside current institutions. More probably, however, the party system is undergoing a process of recomposition, and will reform with even more stability. The programmatic differences that have sustained the existing parties remain salient, and registration barriers as well as strict campaign-finance regulations make it difficult for new alternatives to gain a foothold. On the basis of this structure, the party system could reform with MORENA substituting for the PRD as the standard-bearer of the left and the PAN coordinating opposition from the right. If the PRI can once again rise from the ashes, the system will include an extra “half-bloc” that could play a pivotal role by swinging support to one of the two main blocs. As late as 2017, the 64-year-old AMLO looked like anything but a sure bet for the presidency. In 2006, at a time when conditions favored the left throughout Latin America, he came within 0.56 percentage points of winning the presidency, yet with only 35.3 percent of the vote. In 2012, his star faded as he lost by 6.7 percentage points. On both occasions he headed the ticket of the PRD, a party with the loyal support of about 15 percent of the electorate, but AMLO seemed unable to reach the large group of moderate independents that lay beyond. During these prior runs, his polarizing rhetoric, including claims that [End Page 32] he lost the presidency due to vote fraud and other dirty tricks, and his acceptance of the title of “legitimate president” bestowed by his backers in 2006, stoked his base but made him easy fodder for rivals’ campaigns. His 2014 decision to found MORENA also seemed risky. Not only would it compete for the PRD’s limited vote, but Mexico’s election law puts new parties at a considerable financial and advertising disadvantage. Even if AMLO could finally live down his image as a danger for Mexico in 2018, he would now have to compete with independent candidates and a bevy of new small parties portending divided government. Sources: Instituto Nacional Electoral, https://www.ine.mx; http://sitl.diputados.gob.mx/LXIV_leg/info_diputados.php; http://www.senado.gob.mx/64/senadores/por_grupo_parlamentario. What was it that instead produced the results summarized in the Table above? How has Mexico come to have its first unified government and first majority president since the advent of competitive democracy in 2000? At the same time, antisystem sentiment soared during the last presidential term, especially among the large group of independents. By the 2018 campaign season, just 26.2 percent of independent voters said that they were very or somewhat satisfied with democracy in Mexico, and less than half said that they respected the country’s political institutions, down from two-thirds in the mid-2000s (again per AmericasBarometer). In addition, trust in political parties fell to just 13 percent. Independent voters were both more numerous and hungrier for something other than the status quo. Other analyses paint a bleaker picture. Although antipoverty programs have broadened access to a number of important services, the federal government’s own measure of income poverty (including subsidies as well as wages) reveals scant progress between 1992 and 2016. Nearly a fifth (18 percent) of Mexicans still make less than the cost of the basic food basket, and more than half (51 percent) earn less than the government-estimated cost of basic goods and services.5 Severe poverty [End Page 34] is about sixteen times more common in rural than in urban areas, and it clusters with special density in the southern states. Meanwhile, privatization has created billionaires and increased the concentration of wealth at the very top of the distribution. Officialdom’s coziness with big business has earned Mexico the sixth place on the Economist’s Crony Capitalism Index. Amid all this, and with inflation more than doubling between 2015 and 2017, the insistence by both PRI and PAN administrations that structural reforms would yield broad prosperity rang hollow to many. Corruption can be much darker than simple graft. In too many parts of Mexico the rule of law is weak, and criminal organizations confront public officials with the choice of plata o plomo—a bribe or a bullet—that all but forces holders of the public trust to become complicit with criminal agents. [End Page 35] In one of the most jarring examples, 43 college students in the state of Guerrero disappeared in September 2014, probable victims of mysterious ties among the local mayor, the police, and a drug-cartel faction. Public anger at these persistent problems put the PAN and the PRI in a bind. As the two parties that held the presidency since Mexico’s democratization in 2000, they needed candidates who represented a “fresh start” in independents’ eyes, yet whom party insiders and loyalists could also accept. Neither party found such a candidate in 2018. With President Enrique Peña Nieto beset by historically low approval numbers and an air of corruption and incompetence swirling around his administration, the PRI sought a candidate undamaged by scandal. It settled on Meade, a technocrat who had served in PAN and PRI cabinets but lacked an electoral record and even a formal PRI affiliation. Meade was an awkward candidate with a weak personal presence who devoted his first campaign ads to explaining how to pronounce his last name. Needing to distance himself from a party in disrepute, he held back from forging strong links with sitting PRI governors. Without their help, the PRI could not leverage its unique advantage—it has Mexico’s only nationwide party organization that can deploy legions of canvassers and encourage support through clientelistic linkages. The PAN suffered a similar fate in its attempt to provide an alternative to the status quo. Anaya won a bruising nomination battle with a modernizing and centrist discourse. He distanced himself from the mano dura security policies of the prior president from the PAN, Felipe Calderón, and sought to woo independents by crafting Por México al Frente, the alliance leaguing the PAN with its old archrival the PRD plus a small leftist party. Unfortunately for Anaya, forging this coalition split and weakened the PAN. During the campaign, the two trailing candidates undercut each other, with the PRI camp hurling money-laundering charges that made Anaya look like part of the malignant status quo that AMLO railed against. The only partisan bloc not weighed down by the baggage of earlier administrations was AMLO’s. His credentials were further burnished by quitting the PRD, which supported part of Peña Nieto’s 2012 structural-reform package. Making the most of his advantage, AMLO built a master narrative of regime crisis rooted in generalized corruption. He blamed bad government for poverty and inequality, public insecurity, poor services, [End Page 36] and the misuse of public funds. He denounced technocrats and crony capitalists as a “mafia of power” that had used the “PRIAN” (an amalgamation of the PRI and the PAN) to push ruinous market-oriented reforms since the mid-1980s. Whereas Meade and Anaya courted centrist independents through traditional means by making moderate economic-policy appeals, AMLO did so by mobilizing a cleavage pitting “ins” against “outs” and the status quo against change. AMLO’s denunciation of a cynical ruling elite that he called a “rapacious minority,” utterly out of touch with the plight of ordinary people, was a holdover from prior presidential runs. New in 2018 were his calls for a “big tent” coalition against these entrenched interests, even if his statements were occasionally inconsistent. On the one hand, he struck irenic tones akin to Lula’s successful run for Brazil’s presidency in 2002, saying he would “govern for all” and calling for peace, love, and reconciliation. On the other hand, he nodded to conservative interests and embraced hawkish fiscal positions. He met with the CEO of the investment firm BlackRock, and he pledged to maintain macroeconomic orthodoxy, respect property rights, cut the fiscal deficit, and not raise taxes. This mixture of openness and surgical attacks seemed to work. Not only did AMLO win 97 percent of the precincts that had gone to the PRD in 2012 and 52 percent of former PAN precincts, but he drained the PRI’s power base by carrying 79 percent of its 2012 precincts. At the individual level, AMLO drew his support almost evenly from across all income and education groups. He did poll his best among men and urban voters with more than primary schooling and higher incomes, but the difference was not dramatic. Broadly put, AMLO followed the general recipe for winning the Mexican presidency under democracy: attract independent voters. Yet the ingredients and the proportions of this recipe have changed. Independent voters are now a bigger chunk of the electorate, and this time around they were not only centrists on economic policy but also felt a strong antisystem pull. They viewed the PRI and the PAN as jointly responsible for disappointing economic performance, rising crime and violence, and chronic corruption. Although the PRD never controlled the federal government, its acquiescence to Peña Nieto’s 2012 reform package and its control of the relevant governor’s and mayor’s offices when [End Page 37] the 43 Guerrero students disappeared weakened its appeal. The party system inherited from the dominant-party era is clearly under stress. In democracies, elections are routine events that rarely transform the party system. Mexico’s 2018 election, however, leaves significant changes in its wake. As noted, partisan dealignment is possible, but we argue that the more likely outcome is a recomposition of the system with strong programmatic alignments. Several forces push toward dealignment. Independent voters are growing more numerous and hold more antisystem attitudes. Rejection of the status quo pummeled the traditional parties. It spread turmoil within both the PRI and the PAN, forcing splits, awkward alliances, and the nomination of candidates who could not bridge the gap between party loyalists and independents. The PRI’s historic loss will force it to confront thorny questions about its identity under democracy. Like other authoritarian successor parties, the PRI after 2000 promoted itself as the “steady hand” that could steer the ship of state smoothly. After the unpopular Peña Nieto administration, its reputation is in tatters. Much of its presence at the regional and local levels is gone, and rival factions fighting over what is left could rip the party apart. The PAN has long had the most coherent identity of any party, born of high barriers for new members to join and a hierarchical internal structure.13 Yet its campaign alliance with the (probably moribund) PRD sparked defections and cast doubt on the PAN’s conservative credentials. In some ways, MORENA is the least structured of the major parties. It is only a few years old and served as a personalistic vehicle for AMLO’s drive to the presidency. It represents a diverse coalition of traditional leftists from the PRD, labor unions, breakaway PRI and PAN elites, and even social conservatives associated with evangelical churches. How the disparate interests and agendas of all these groups can be satisfied is hard to see. Failure to meet the high expectations that AMLO fostered on the campaign trail could split MORENA, and the prohibition on reelection will touch off a potentially divisive succession battle as his term nears its end. Unlike other leftist leaders in Latin America who have pushed constitutional reforms to permit reelection, AMLO is likely to respect the strong norm of no reelection that is rooted in the 1910 Revolution. If Mexico’s party system were to truly decompose like Peru’s or Venezuela’s, important aspects of democracy would erode. Displeased with the partisan alternatives, citizens might engage in serial protest voting, go outside institutional channels to voice discontent, or withdraw from politics altogether. The discrediting of party organizations could discourage office-seekers from accepting the demands of party life, such as agreeing on policies and cultivating party labels that give citizens a shorthand sense of what they are voting for. Instead, direct mass-media appeals and personalistic vehicles assembled for immediate campaign purposes could become the main routes to power. Electoral politics would become more fluid and erratic, making legislative coordination difficult, complicating policy implementation, and even opening the door to authoritarian leaders who can, in the absence of organized partisan opposition, more easily undermine liberal rights. This core logic has not been overturned, nor have the actors suddenly changed. With an ideology and platform close to the PRD’s and many ex-PRD activists in its ranks, MORENA has a strong note of continuity with its leftist predecessor. AMLO too is a product of the existing system more than he is a disruptive outsider. He is a professional politician who rose through the ranks of the party system, not a military figure like Venezuela’s Hugo Chávez, nor a social-movement leader like Bolivia’s Evo Morales. After a dozen years in the PRI, López Obrador joined the PRD upon its formation in 1989. Later, he ran for the governorship of his home state of Tabasco on the PRD ticket, served as party president, won election as head of government in Mexico City, and ran for the presidency in 2006 and 2012. Institutional rules also facilitate continued stability in the party system. The National Electoral Institute (which administers voting), the Federal Electoral Tribunal (who interprets election law and certifies results), and the Specialized Prosecutor for Election Crime (which investigates charges of malfeasance) have a combined track record of giving the country free and fair elections. Political parties have legal status as “public-interest organizations,” making them subject to the election-management bodies’ strict rules regarding party organization and campaign dynamics. AMLO has been these bodies’ biggest critic, with his [End Page 39] charges that fraud and other malfeasance cost him the presidency previously. Having overseen the electoral process that produced his 2018 win, however, these institutions emerge reinforced. The “rules of the game” in Mexico are stacked against new parties and independent candidates. Party finance and media access are doled out by formula and paid for out of public funds, with virtually no private contributions permitted. This gives extant and larger parties an edge. Although MORENA is a new label, it is no accident that most of its candidates and personnel are veterans from other parties, chiefly the PRD. Other parties and, for the first time, independent candidates competed in 2018, but they were at such a disadvantage that two of the newer entrants will lose their registration. The rules yield party leaders with control over funding and nominations, encouraging coordination between local and national politicians under a small number of labels. The PAN and the PRI have lost vote share, but the system’s design shields them from competition by limiting new entrants. The underlying programmatic alignments that sort political elites and voters into distinct blocs, along with the rules that privilege larger existing parties, should be enough to keep the system going as it adapts itself to the post-2018 reality. The left has a new and more muscular mainstay in MORENA. The size of its bloc will depend on how well AMLO manages expectations and how well MORENA institutionalizes itself. Given electoral rules that reward electoral performance, the party will go into the 2021 midterms with solid funding and media access, plus unprecedented access to public office across the country. The geographically broad appeal that MORENA showed in 2018 bodes well for its future as a national political force. The open question is whether this two-bloc system has space for a large third party. The PRI was once history’s most successful dominant party, having ruled Mexico continuously from 1929 to 2000. It still holds a dozen governorships, about a third of state-legislative seats, and many local governments, but its brand is damaged and its resources diminished. Perhaps its best chance for renewal depends on its remaining governors to coordinate on a platform that positions the PRI between the major left-wing and right-wing blocs. A centrist PRI willing to negotiate with MORENA could become pivotal during upcoming policy debates. AMLO’s congressional coalition is 21 Chamber of Deputies votes and 16 Senate votes shy of the supermajority needed to pass constitutional reforms, including overturning the 2013 education law that the president-elect opposes. Parties are notoriously disciplined in Mexico’s Congress. Thus, if the PAN and its allies stand in opposition to the AMLO administration, the PRI could exact a high price for its cooperation. The size of AMLO and MORENA’s victories could enable some of his coalition’s most strident leftist voices, but his government will likely respect the market model, private enterprise, and the importance of continued commercial relations with the United States. During the campaign, he sounded more like a fiscal hawk than a traditional leftist, pledging to respect the central bank’s autonomy, cut the public deficit, not raise taxes, and launch new fiscal-austerity measures that include cutting salaries and perks for top and upper-middle government employees and eliminating temporary public jobs. AMLO’s government will likely focus on infrastructure and social spending in an attempt to expand access to education, spur job growth, and diminish inequality. He has proposed new cash transfers for teenage students and unemployed young people, more generous universal pensions for the elderly, and public investment to stimulate the domestic market and invigorate the energy sector, including building new oil refineries. Perhaps the pressing area where clear ideas are least apparent is security. For the time being, we expect intelligence cooperation with the United States to continue, and the military to retain its policing duties in the most violent regions. AMLO’s plan to finance his spending programs through more stringent control over the public budget will likely enhance executive power. He has appointed 32 coordinators, one per state, who will oversee federal spending. Even if these coordinators do not exert partisan pressure on opposition governors, they are bound to raise tensions in Mexico’s formally federal system. Nevertheless, the budget for AMLO’s programs is unlikely to be balanced by the cost savings from moving against government corruption and wasteful spending. Finding the money elsewhere will require tough decisions that could strain his support coalition. Interestingly, he has [End Page 41] called for a constitutional reform to require a referendum on his presidency concurrent with the 2021 midterm elections. We may thus have an early indicator of the public’s confidence in Mexico’s first democratically elected president with a majority mandate. 1. Kenneth F. Greene, Why Dominant Parties Lose: Mexico’s Democratization in Comparative Perspective (New York: Cambridge University Press, 2007). 2. Other series show independents peaking at 66 percent. “Proyecto: Partidos Políticos,” August 2017, www.buendiaylaredo.com/publicaciones/425/B_L_UNIVERSAL_PARTIDOS_POLI__769;TICOS.pdf. 3. Kenneth F. Greene, “Campaign Persuasion and Nascent Partisanship in Mexico’s New Democracy,” American Journal of Political Science 55 (April 2011): 398–416, https://doi.org/10.1111/j.1540-5907.2010.00497.x. 4. Luis de la Calle and Luis Rubio, Mexico: A Middle Class Society : Poor No More, Developed Not Yet(Washington, D.C.: Woodrow Wilson Center, 2012). 5. Consejo Nacional de Evaluación de la Política de Desarrollo Social (CONEVAL), “Evolución de las Dimensiones de la Pobreza 1990–2016,” https://coneval.org.mx/Medicion/Paginas/Evolucion-de-las-dimensiones-de-pobreza.aspx. 6. Secretariado Ejecutivo del Sistema Nacional de Seguridad Pública, “Tasas por cada 100 mil habitantes 1997–2017,” 20 January 2018, http://secretariadoejecutivo.gob.mx/docs/pdfs/tasas%20por%20cada%20100%20mil%20habitantes/Tasas122017.pdf. 7. Human Rights Watch, “Mexico, Events of 2016,” www.hrw.org/world-report/2017/country-chapters/mexico. 8. INEGI, “Encuesta Nacional de Victimización y Percepción Sobre Seguridad Pública (ENVIPE) 2017: Boletín de Prensa, Núm 417/17,” 26 September 2017, www.inegi.org.mx/saladeprensa/boletines/2017/envipe/envipe2017_09.pdf, 6. 9. INEGI, “Encuesta Nacional de Calidad e Impacto Gubernamental (ENCIG) 2017: Principales Resultados,” March 2018, www.beta.inegi.org.mx/contenidos/proyectos/enchogares/regulares/encig/2017/doc/encig2017_principales_resultados.pdf. 10. Causa Probable, “Según el Corruptómetro, los partidos más corruptos, de cara a 2018, son:,” https://causaprobable.com/2016/09/21/en-mexico-los-partidos-mas-corruptos-el-priprdverde-ecologista-y-pan. 11. Article 19, “Periodistas asesinados en México,” 24 July 2018, https://articulo19.org/periodistasasesinados. 12. AmericasBarometer shows support for income redistribution and state ownership decreased by 11.5 and 9 percentage points, respectively, from 2008 to 2017. 13. Greene, Why Dominant Parties Lose. 14. Kenneth F. Greene and Mariano Sánchez-Talanquer, “Authoritarian Legacies and Party System Stability in Mexico,” in Scott Mainwaring, ed., Party Systems in Latin America: Institutionalization, Decay, and Collapse (New York: Cambridge University Press, 2018), 201–26.